Hosted by Anderson Cooper, the documentary Journalists Killed in the Line of Duty profiles six of the 46 reporters who were killed or murdered as a direct result of their work from January 2002 through April 2003. 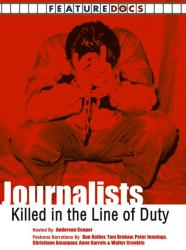 Produced with the goal of educating about the dangers of on-site journalism and a plea of support for those who risk their lives to bring others the truth, Journalists Killed in the Line of Duty highlights an important consequence of the increasing reach and scope of worldwide media. Read the following questions once (this gives you an idea of what to pay attention to while watching). Then watch the clip and answer the questions by checking TRUE or FALSE or NOT GIVEN.